Iconic Western scenes await visitors to Mount Rushmore National Park in South Dakota. 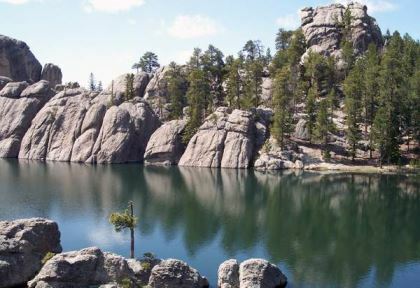 This summer, consider visiting some of South Dakota’s most renowned parks and natural wonders. The idea of traveling to FMCA’s 88th Family Reunion and Motorhome Showcase in Gillette, Wyoming, this June can really stir a traveler’s imagination. Look on a map and you’ll see that Gillette is so close to some of the West’s most famous scenes that a motorhomer can feel obligated to experience as much as possible. Several of those “mandatory” places reside in the Black Hills or Badlands region of western South Dakota. Filled with rugged rock formations, magnificent waterways, cool caves, and plenty of places to camp, “great” will barely suffice when describing the scenery. There’s no shortage of wildlife wherever you roam— from bison, spry pronghorns, and shaggy mountain goats to shy prairie dogs. 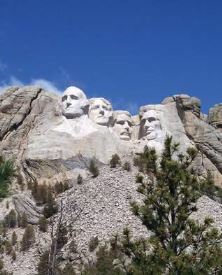 The world’s greatest “rock group” doesn’t play a single instrument, but presidents Washington, Jefferson, Theodore Roosevelt, and Lincoln were each instrumental in shaping America and were chosen accordingly by sculptor Gutzon Borglum to be immortalized in stone on 5,725-foot Mount Rushmore. The best views of the 60-foot-high likenesses of our country’s forefathers are from the Avenue of the Flags and the Grand View Terrace. For an even closer look, hike the 1/2-mile Presidential Trail to the base of the mountain. Stately ponderosa pines flank the trail, and you may even spot some of the white, shaggy mountain goats that live here. America’s “Shrine of Democracy” is a true testament to 14 years of skill and dedication shown by sculptor Borglum and the 400 coworkers who completed the colossal carving in 1941. Maybe even more amazing is the modest price tag for the project: less than $1 million, top to bottom. What a bargain for a priceless national treasure! There is no entrance fee for Mount Rushmore National Memorial. However, an $11 fee is charged for cars and RVs to park at the memorial, and you likely will need cash, as credit cards were not accepted as of early 2013. Parking for vehicles towing other vehicles is extremely limited. For more info, call (605) 574-2523 or visit www.nps.gov/moru. If you wish to see only Mount Rushmore, you can make a day trip of it from Gillette, as it is a 3-hour drive. However, so much is available in this area, it’s best to plan to stay for a few days to enjoy it thoroughly. Crazy Horse Memorial is a work in progress, so bring a little imagination when you visit. Korczak Ziolkowski, a self-taught sculptor who assisted Gutzon Borglum in creating Mount Rushmore, began the project in 1948 and worked on it exclusively until his death in 1982. Decades from now when the memorial is finished, it will be the largest carving in the world, featuring a 641-foot-long, 563-foot-high monument to Indian chief Crazy Horse (Tasunke Witko) sitting astride his trusty steed, pointing to his ancestral lands. The native’s face was completed in 1998. Work continues on the remainder of the sculpture at a very slow pace, for the Ziolkowski family relies solely on donations and profits made from entrance fees and souvenirs; they receive no government funding. The complex includes a welcome center, a museum, a gift shop, and a small restaurant. It is approximately a 25-minute drive west of Mount Rushmore on U.S. 16/385. Fees include a $10 per person entrance charge, plus an optional $4 per person bus ride to the base of the mountain. For more information, call (605) 673-4681 or visit www.crazyhorsememorial.org. A highlight of this park, the second-largest state park in the United States, is the 18-mile Wildlife Loop Road Scenic Byway. This two-lane paved route is well named! In addition to spotting buffalo, deer, elk, antelope, and prairie dogs, you also may encounter the park’s friendly “begging burros.” These unofficial long-eared park ambassadors are actually feral descendants of a herd of burros that were used by the park in the 1920s to give trail rides up to 7,242-foot Harney Peak, the highest point in the Black Hills (you can hike up there now). If you visit in the spring, you’ll see how Wildlife Loop Road brings views of adorable young buffalo calves. Getting to Custer State Park from the Mount Rushmore/Crazy Horse area is as scenic as the park itself. Iron Mountain Road (U.S. 16A) is 17 paved miles of hairpin curves, “pigtails” (unusual bridges that double back on themselves in a curly-Q shape), and square rock tunnels that perfectly frame the landscape and Mount Rushmore. An alternative is to drive the Needles Highway (State Route 87). The less narrow 14-mile road enters the northwestern portion of the park through thick aspen, birch, and spruce trees backdropped by pointy granite spires (hence the name Needles Highway). Both routes are suitable for motorhomes. Park entrance fees are good for seven days and cost $15 per vehicle. Several campgrounds are available at the park, some with electrical hookups. For general information, contact the park at (605) 255-4464; www.gfp.sd.gov/state-parks/directory/custer. For campground information, call (800) 710-2267 or visit www.campsd.com. A literal jewel of the Black Hills is the aptly named Jewel Cave National Monument, discovered by gold prospectors in 1900. Less than 2 miles of the cave was mapped by 1908 when President Theodore Roosevelt proclaimed Jewel Cave a national monument, but now 164 miles of crystal-lined passages have been found, making it the world’s second-longest cave on many lists (Mammoth Cave in Kentucky is the first). Most of the known passageways were found in the 1960s by rock-climbing enthusiasts Herb and Jan Conn. While the calcite crystals are interesting, you’ll see more amazing features by heading 240 feet underground for a ranger-led tour. Cave popcorn, cave bacon, dripping flowstone, and fragile hydromagnesite balloons are among them. The “balloons,” while small in stature and number, are rare in North America. There are no entry fees at Jewel Cave, but tour fees do apply, and they vary according to the tour selected. For more information, phone (605) 673-8300 or visit www.nps.gov/jeca. Wind Cave has many claims to fame. It is the world’s fourth-longest cave (nearly 140 mapped miles), and contains 95 percent of the world’s discovered boxwork formations. Boxwork is a box-like or honeycomb pattern of thin blades of calcite that form on the cave walls and ceiling. You’ll see many examples of this if you take a popular ranger-led tour. Wind Cave is also the first cave to be designated a national park, thanks to Theodore Roosevelt in 1903. The cave takes its name from the wind movement at the cave entrance. When the atmospheric pressure is higher outside than inside the cave, wind rushes in; when pressure is higher inside the cave, the wind rushes out. At times, these winds have been measured at the cave’s walk-in entrance at more than 70 mph. Tom Bingham is officially credited with finding this cave in 1881, but local Indians have known about the site for centuries. To them, this cave is sacred and believed to be the place where mankind first emerged from the underworld, where they had lived before the creation of the world we now know. Wind Cave National Park is also known for its wildlife — a free-roaming bison herd, elk, and pronghorn antelope make their home in one of the largest remaining natural mixed-grass prairies in the United States. The park was expanded by 5,555 acres in October 2011 to include former ranchland, a historic homestead, and a 1,000-year-old buffalo jump. The latter is a spot where Indian hunters stampeded herds over a cliff. Like Jewel Cave, Wind Cave has no entry fee, but tour fees do apply. Wind Cave does have a campground, however, with water, but no hookups or showers. For more information, call (605) 745-4600 or visit www.nps.gov/wica. It is approximately 2 hours and 15 minutes from Wind Cave to the place the Lakota Indians called mako sica (bad lands). They surely couldn’t have been referring to the striking topography! Created by layers of sediment and volcanic material deposited over millions of years, followed by thousands of years of erosion, Badlands National Park is filled with sharp buttes, pinnacles, and spires. Once you reach the town of Wall along Interstate 40, turn south on State Route 240 (for reasons to stop at Wall, see the accompanying sidebar). To best experience this 244,000-acre national park on the edge of the Great Plains, drive the twisty but paved 30-mile Badlands Loop Scenic Byway eastward, toward the Ben Reifel visitors center and park headquarters. Keep your camera and binoculars handy for spotting bighorn sheep, mule deer, and many species of birds. A side trip down the unpaved Sage Creek Rim Road to the west will bring you to Roberts Prairie Dog Town and even more spectacular views. If you had visited this area 30 million years ago, you would have seen three-toed horses, giant pigs, and oreodonts (sheep-like herd animals). Because the land was then a mix of swamp and savannah— good conditions for preserving animal bones and plant material— one of the world’s richest fossil deposits is located inside the park. You’ll see models of these ancient mammals and fossils in the visitors center. A $15 entrance fee per vehicle at Badlands is valid for seven days. Two campgrounds are available; Sage Creek is free, but it is primitive (without water, also) and not recommended for large RVs, because of its unpaved road. Cedar Pass is a commercially run RV park near the Cedar Pass Lodge, located near the park visitors center. For more information, call the park at (605) 433-5361; visit www.nps.gov/badl; or, contact Cedar Pass Campground at (605) 433-5460; www.cedarpasslodge.com. From forests so thick they make the hills appear black, to towering granite formations, prairies, and rivers so rich they started a gold rush, you won’t be disappointed by the “Great Faces and Great Places” found in western South Dakota, as a tourism slogan suggests. The greatest problem you’ll have is deciding what to see first, so plan to stay awhile! Before you head south of Wall off Interstate 40 to explore Badlands National Park, you may want to make a stop at Wall Drug, South Dakota’s most popular roadside attraction and one of the most renowned tourist stops in the world. For travelers, it’s a popular source of entertainment, souvenirs, and food, along with free ice water — a tradition that has continued since 1936. Wall Drug, 510 Main St., Wall, SD 57790; (605) 279-2175; www.walldrug.com.